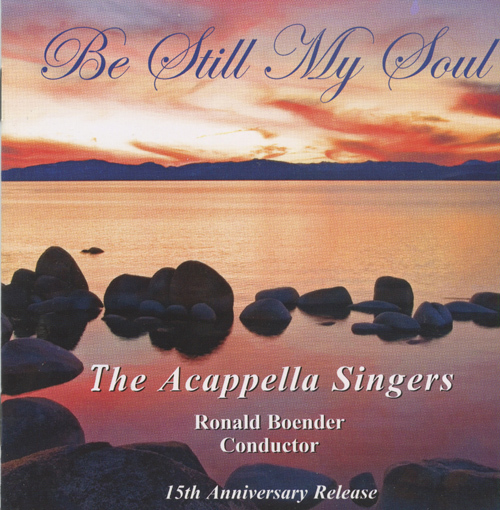 Celebrating their 15th year of performing in South Florida, and their "Be Still My Soul," their 8th album, The mixed-voice (20 women, 16 men) Acappella Singers are all Christians, and drawn from a hundred-mile radius, but are not affiliated with any particular denomination. Concerts are performed in churches, special and corporate events, and the group are the "resident singers" at Butterfly World, a local attraction. They sing both sacred and secular music, but always "To God's Glory." There are 14 spirited tunes here, a few with non-vocal percussion and piano. Favorites are "Uyai Mose," "Give Me Jesus," the rousing spiritual "Ain't Got Time to Die," the richly harmonic "Rise Up O Men of God," Felix Mendelssohn's "Cast Thy Burden Upon The Lord," "O Love That Will Not Let Me Go," Andrew Lloyd Webber's soaring "Pie Jesu," the powerful hymn "Be Still My Soul" and the traditional "The Lord Bless You and Keep You." The Singers are wonderfully led by Conductor Boender, their arrangements are excellent, and their sound is effortlessly clean, fresh and beautifully blended. This is a veteran choir with tremendous talent and spirit, and every song is perfect!